Even though it is now six years old, the dramatic, energetic and cantilevered form of the Mabel Fidler building at the prestigious all-girls Ravenswood School in Sydney is still a show stopper. Thanks to the translucent quality of the walls – created using a polycarbonate exterior cladding – the building literally glows day and night. Translucent internal glazing acts as sheath to the steel superstructure, and adds to its resplendence. While some would see the polycarbonate cladding as a potential fire hazard, the award-winning design has become a beacon of creative product use that additionally adheres to the stringent fire codes required of such buildings. “Of course, the building has a sprinkler system throughout,” says Knut Menden from BVN Architecture, and one of the designers behind the Mabel Fidler building. The polycarbonate panels were taken into account when considering fires. “A fire can burn a hole through the wall, allowing an escape path for smoke,” the senior associate explains. Mark Prior, CEO of Boss Fire, sees the invention of new passive fire controls as vital to preventing loss of life and property in school situations. In fire separation, for example, materials act as a retardant to stop the fire spreading. The method involves creating zones, which act like cells within the building. “Up until eight years ago, fire separation was static; it really hadn’t changed in decades,” says Prior. Creating a barrier to maintain separations is crucial for passive fire control. This is particularly important in the parts of a school that could have a higher than ordinary fire risk, such as storage areas, clean laboratories and other similar places where flammable materials can accumulate. “Barriers are only as effective as their vulnerability, and one certain way to increase vulnerability is to allow a fracture in the barrier,” he says. Boss Fire and Safety says they have been able to overcome this issue with a range of products designed to protect the integrity of those barriers. This includes fire-rated mastics and a range of penetration seals that work both in new builds and in retrofit situations as one way of solving so-called ‘data ducting’ issues. This is where networks of cabling within the structures provide a path of which can cross modular composite walls, creating a lethal breach in the fire protection of the area. To combat this, Boss Fire uses FyreBox Cable Transits to seal holes in walls caused by the traversing of communication and data lines. According to Prior, these transit boxes are simple to install, and consist of a square or round sleeve containing heat reactive intumescent polymer which, when heated by, fire rapidly expands. In the process, both the box and the cable corridor are sealed. Then there is the use of fire-retardant internal building materials. CSR Gyprock also offers a range of fireproofing products designed for education employment with plasterboards designed for use in fire-rated situations. Compliant with fire check ratings, one of the product ranges has the memorable name Frycheck, and it meets both smoke growth ratings as well as fire resistance. 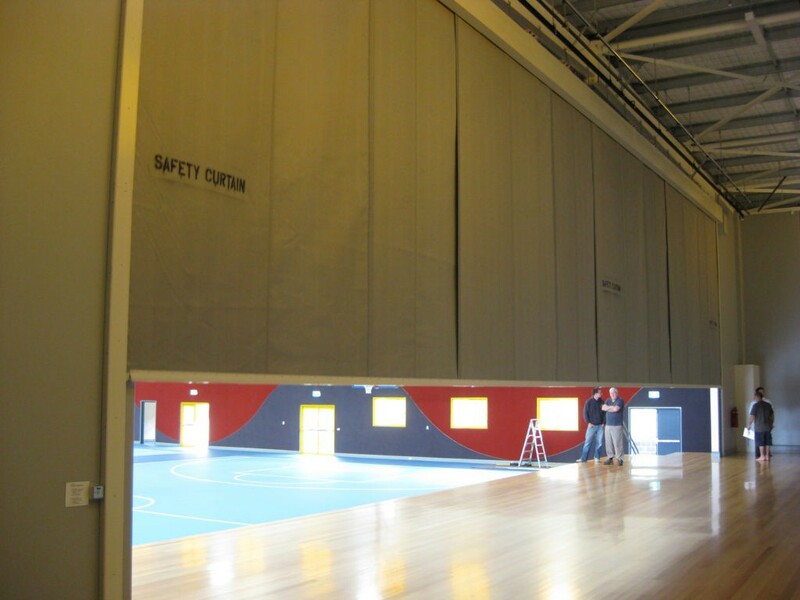 There is also the concept of creating safe cells or zones using fire and smoke curtains. For example, when Green Fire’s FireMaster curtain drops, it is designed to not only create a barrier, but to also create exit corridors allowing for safe egress. From a design point of view, the FireMaster curtain remains concealed in the ceiling cavity when not in use. “They maintain the architectural integrity of a space,” says Clinton Green of Green Fire. The curtains are deployed by thermal sensitive switching, or in the event of that system being disarmed, they can be released manually. Open staircases, known as fire corridors, and other methods of egress become protected routes away from disaster. A further advantage to this system is that in the event of a false alarm, the curtain walls can be reset with little effort, with no damage caused to the building contents. The ability to pass the fire code while not interfering with the architectural design is certainly an area of interest considering the number of timber-framed and heritage-listed buildings that are used by educational institutions. The increasing use of exposed timber in design has opened an entirely new set of opportunities for fire protection specialists. “It’s called Fireshield,” says Prior from Boss Fire. While timber coatings and fire-retardant paints have been available before, this new product goes on clear, maintaining the integrity of the design. “It allows for highly decorative work, with no floor space lost to additional CLT safety laminating,” says Prior.